ON THIS DATE (August 21, 1961) ... A crowd of 19,773 went through the rain and raised between $50,000 and $60,000 for the Jimmy Fund, in welcoming the Braves back to Boston for at least one night. They booed the Red Sox and cheered the Braves who defeated their once cross-town rivals 4-1. The crowd saw Braves pitchers hold the Red Sox to just one hit thru the first six innings. 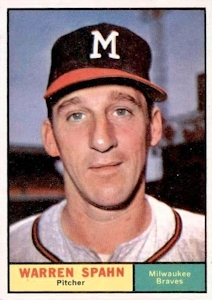 Before the game Warren Spahn received a Certificate of Merit from Cardinal Cushing, and the he blinded the Red Sox only 24 hours after winning his 302nd career game. Spahn pitched the first inning and struck out Chuck Schilling, made Pete Runnels ground out, and struck out Carl Yastrzemski. He was followed by Lew Burdette, Carlton Willey, Don McMahon, Tony Cloninger, Bob Hendley and Johnny Antonelli. Eddie Mathews, who played the final season the Braves were in Boston, got a hit off Galen Cisco in the third inning when the Braves scored all their runs..